Review: "Moonspell: The Antidote" - Sea of Tranquility - The Web Destination for Progressive Music! This is different : a novel written about an album! No, you read that right � it's quite the reverse of your standard concept album written for a book. Portuguese novelist Jose Luis Peixoto is something of a rising star in his language medium, and he wrote the novelette The Antidote after Moonspell's album had been completed. Each chapter in the novel is inspired by one of the ten tracks on the album. Moonspell's music has been variously described as dark, black, gothic and doom metal. None of these labels sits easily, though, because their sound combines elements of all of these sub-genres. At first listen you'll write them off as just another death-metal band complete with excessive guitar distortion, double-bass, and cookie-monster growling. But then there's that other style that makes it so dark and haunting and � gothic. The gothic tones are led by crunchy rhythm with spacey samples floating over the top, and Fernando Ribeiro's unusual vocals: When he takes off his cookie-monster hat his voice is somewhat similar to Johan Edlund of Tiamat. His singing is rich and melancholy, delivered in very deep, bass registers. These dark, moaning vocals are the signature sound of The Antidote. 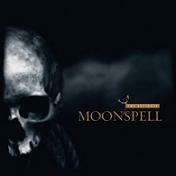 At the time of writing, Moonspell is on tour with Opeth � which is an appropriate billing, given their musical style. Interestingly, the album starts out with a guttural, belligerent death metal sound, but graduates to a more traditional melodic heavy metal. A common formula is those clean but somber vocals in the verses, alternating with brutal death metal in the chorus. Some tracks are fairly boring and none are really exceptional, yet as a whole, The Antidote makes for a satisfyingly introspective listen. Standout track is "Capricorn At Her Feet", one of the songs that blends the somber and the gruff singing, but it adds a haunting whisper to those mixed vocal styles, and has spacey keyboard effects, driving rhythm, sharp percussion and a memorable if gloomy melody. The lyrics are deep and philosophical, and although this is not a concept album, the songs are thematically connected. The CD includes a video for "Everything Invaded", and an digital copy of Peixoto's The Antidote. The software leaves something to be desired, and it takes energy to sit down and read the whole thing on your PC. But if you do, the album takes on a fuller meaning and the whole experience of The Antidote is more complete. Musically, this gets 3 � stars. Adding in the novel-based-on-music and evaluating it as a whole elevates the rating to 4 stars.